Yes, my three big girls have all graduated from our home school. In 2013 when BooBear graduated, we didn't have a beautiful professional diploma to give her. We did a small ceremony and printed out a nice piece of paper to give her. Her dad gave a really touching speech. 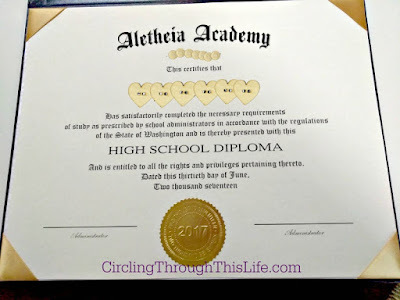 In 2016, the Homeschool Review Crew had the opportunity to review a high school diploma from Homeschool Diploma. I received a Personalized Diploma for Turtlegirl and I purchased a Standard Diploma for Boo Bear. In 2017 Tailorbear graduated and I had every intention of purchasing a diploma for her. My husband and I had talked about it. 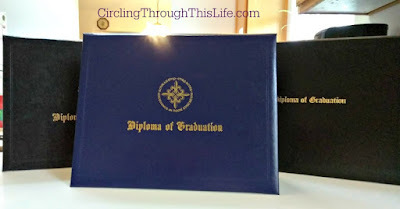 We were so impressed with the quality of the diplomas and the service provided by Homeschool Diploma but I procrastinated. I kept putting it off and putting it off. I am pretty sure I win the loser mom of the year award for not having it for her at graduation. 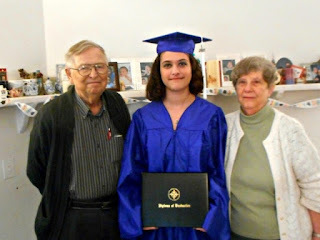 We then found out that the Homeschool Review Crew would have the opportunity to review Homeschool Diploma again. Tailorbear was excited when I told her that mom now had the kick in the pants to order her a diploma. Did she want the Standard Diploma? Did she want the Personalized One? We actually pulled out her sisters' diplomas and looked at them. She said she didn't have a preference but I decided I preferred the options available with the Personalized Diploma. Homeschool Diploma offers their High School Diplomas in two sizes 8.5 x 11 and 6 x 8. We chose the larger size for each of the girls. Homeschool Diploma also offers a savings when buying multiple diplomas. This is available for both Standard and Personalized and for both sizes. Both diplomas can be customized with graduate information, location, date of graduation. Both diplomas have a center seal. With the Standard Diploma you only have three choices of embossed foil seals. With the Personalized Diploma you have those same three seals plus an additional choice of five engraved seals. There is an additional cost for the engraved seals. Another major difference between the standard and the personalized is wording. With standard you do not have a choice. You can customize the personalize one with several different wording options. There are four options each with two to three choices. 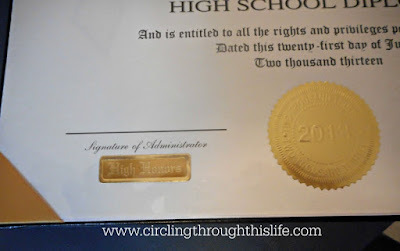 The Personalized Diploma overs an optional Verse or Motto and customized signature lines. The Standard version has two signature lines. One is labeled Administrator and the other Instructor. Withe Personalized for both Turtlegirl and Tailorbear we chose to put Administrator under both lines. Either Standard or Personalized will give you a choice between Ivory and Cream paper but only with the Personalized will you be able to choose, for additional cost, optional hand calligraphy. We did not choose the hand calligraphy for either of the girls. For a small additional cost you can add an honors seal to either diploma. One of the things I loved bout ordering was the link to a chart to help decide which honors seal we should choose. I was thankful that this was available for all diplomas. While I could have gotten an honors seal for Tailorbear she chose not to have one. Both diplomas offer 7 colors and 8 designs for the cover. 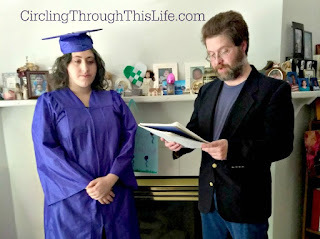 Here is Turtlgirl from her 2016 high school graduation. 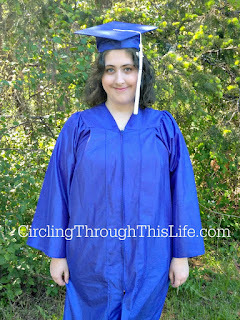 Yes she is wearing a cap and gown from Homeschool Diploma but sadly that particular style is no longer available. She choose a black cover. For each of our girls we had a simple family only ceremony. We decorated the house. We all got dressed up. The graduate got to wear a cap and gown. Honeybear as Father and Principal gave a speech. Each year those speeches have made me cry. He would spend some time working on them jotting down things very specific to the graduate. We are so blessed that Honeybear's parents could fly out each time to be part of the special celebration. After the speech and the photos we would all go out to dinner at special restaurant. Graduation is a milestone event and we wanted each girl to have a special memory of the event. These diplomas are very professional. Having a professionally done diploma is important. It's not just a piece of paper. It represents an achievement. It's opens doors for further education and meaningful employment. 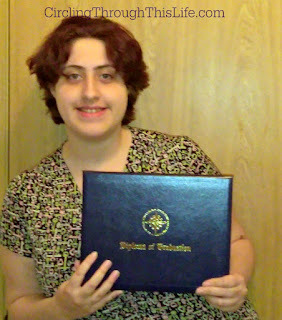 Thanks to Homeschool Diploma each of my graduates have a beautiful diploma to commemorate their achievement. Homeschool Diploma offers an 8th Grade Diploma, and a Cap, Gown, Tassel and Diploma package for kindergarten. Looking for Graduation Announcements or Thank Yous? They offer those as well. Some crew members reviewed high school diplomas. We even have a few who reviewed caps & gowns for their graduate. 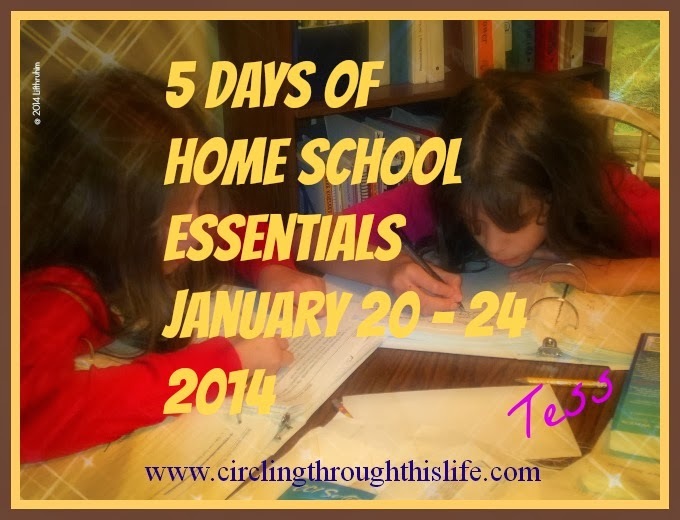 Visit the Homeschool Review Crew Blog to read more reviews!